Magna Carta has long been known for being a leading independent label producing and distributing some of the best talent on the contemporary music scene with an emphasis on musical virtuosity. 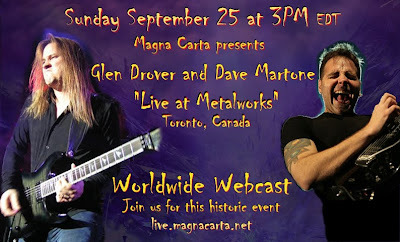 Both Dave Martone and Glen Drover have produced critically acclaimed albums for the label, showcasing their world class talents as guitarists and composers. Dave and Glen individually have developed fans and followers throughout the world who have been impressed with both their technical abilities and emotional depth as artists. Both guitarists will be backed by their own group of outstanding musicians making this both a showcase of amazing talent and an informal “clinic” for musicians around the globe. Now Magna Carta will break ground by presenting both artists in a manner in which very few independent label artists have been seen: live webcasting with superior audio and video capabilities at no cost to the audience who will be able to receive the webcast worldwide. One of the foremost webcasting companies in this field, Orchard TV, will be providing these technological services. “Live At Metalworks” refers to the Metalworks group of companies including award-winning Metalworks Studios the most renowned and recognized recording facility in Canada for more than 30 years. The September 25 webcast of Dave Martone and Glen Drover will be presented from the facility's newly completed North Auditorium. The webcast will also be available as an archive on the Magna Carta website as well as clips being available on Youtube after the live webcast. We invite everyone that has a love for guitar, guitar players, great musicianship, rock'n'roll, cutting edge technology and history made in front of your eyes.